The installation of a swimming pool saftey cover requires patience, skill and attention to detail. 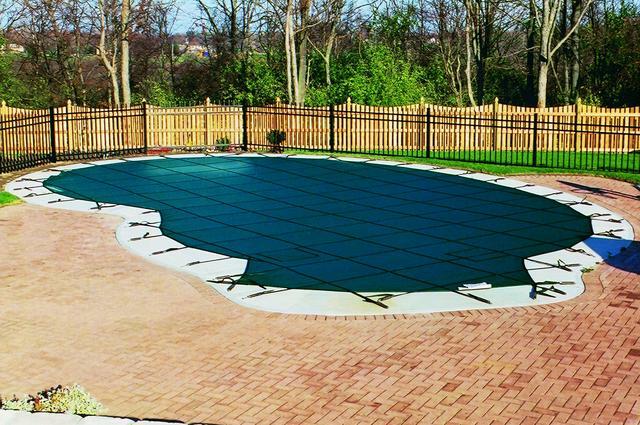 When installed properly, a swimming pool safety cover will look fantastic and provide an excellent layer of safety. The installation process of a swimming pool safety cover begins with the official measurement. In order to manufacture a swimming pool safety cover that will fit the exact shape of your pool, about 100 measurements must be taken. These measurements are entered into a computer that uses triangulation to recreate the shape of your pool. Once the swimming pool safety cover has been manufactured and delivered, the installation can begin. Brass anchors are installed into ¾” holes that have been drilled into the pool deck. These anchors are raised slightly above the deck when the swimming pool safety cover is in place over the water but can be recessed flush with pool deck when the swimming pool safety cover is not in use. Once the anchors are in place, the spring buckle assemblies are attached to the swimming pool safety cover straps. The tension of the spring on each strap is adjusted. Once all of the straps have been adjusted, the installation is complete. Call today and schedule your saftey cover installation!